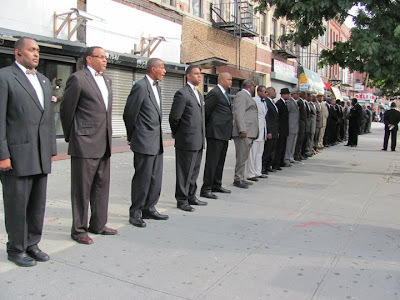 Brother Jesse Blog: People take to the streets at the 'Millions March' in Harlem; Farrakhan gives insight into Ghadafi, Obama, African leaders, NATO strikes and more. People take to the streets at the 'Millions March' in Harlem; Farrakhan gives insight into Ghadafi, Obama, African leaders, NATO strikes and more. 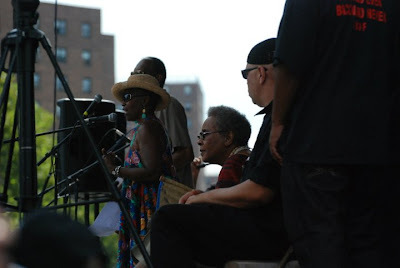 On Saturday, August 13, a huge crowd turned out on Malcolm X Blvd at 110th Street for a march in Harlem, New York led by Viola Plummer and her group December 12th Movement. People assembled to call for an end to the attacks on Colonel Muammar Gadhafi and the heinous bombing of Libya by the US and NATO, illegal sanctions against Zimbabwe by the West, and the Bloomberg administration’s destruction of housing, jobs, education, health care and police abuse, which are all a systematic assault on African communities, according to organizers. The keynote address was delivered by the Honorable Minister Louis Farrakhan of the Nation of Islam. "The greatest gift that we could have, at a time like this, is guidance and warning," he said in his opening words. During his well-received message, Min. 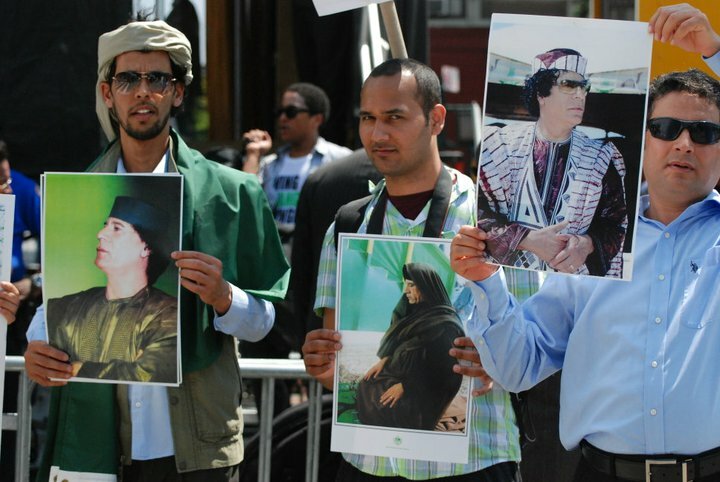 Farrakhan touched on the underreported good works of Col. Gadhafi. "Nobody in Libya is homeless or living under bridges. Every Libyan has free medical attention...Go to Libya and see if you can find Gadhafi living in palaces. He lives in tents," said Min. Farrakhan. He also touched on the need for African leaders to stand up against the Western World's desire for recolonization. "Africa: tell Hillary Clinton and all her representatives that come to you 'Go To Hell!' Stand up Africa and tell Europe 'To Hell With You', he said. In this clip below, Min. Farrakhan responds directly to the allegations that he is financially backed by Col. Gadhafi to defend him and the Libyan Jamahiriya. "For you to malign my character, that you think I speak for him because I need money. I say to hell with all the money that he and everybody else has. I'm not supported by that! I'm supported by Allah and the love of the people....and they have given me more than Gadhafi has ever promised to give me!" he said. Other special guest speakers included: New York Freedom Party member Charles Barron and his wife Inez Barron; Dr. James Mcintosh; Former US Attorney Gen. Ramsey Clark; Kofi Taharka of the National Black United Front; Pam Africa; John Watusi Branch; Amiri Baraka; Malik Zulu Shabazz of the New Black Panther Party; NOI Student Minister Akbar Muhammad, and many others. A delegation from Libya was also in attendance and it was acknowledged that the march was being aired live in Libya, Iran and Tunisia. "It's about the independence and survival of our Motherland, Africa!" said Viola Plummer of the December 12th Movement. "You (police) want to stop and frisk someone, stop those crooks on Wall Street!" said Charles Barron. "This country don't care about Black people dying in Africa. They don't care about Black people dying in America!" Kofi Taharka said "We know that it has never been in our best interest for someone outside of our community to come in and solve our problems. What we're saying is, if its an African problem then it needs to be an African solution." Interestingly, while the march was going on, Rick Perry made his 2012 Presidential run official. 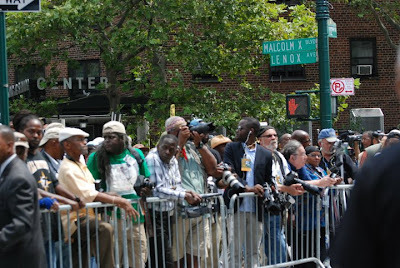 Fittingly, Kofi Taharka led the crowd in Harlem in the chant "Hell No to Rick Perry! Hell No to Rick Perry!" "We're here because we seek justice and oppose injustice," said Ramsey Clark. "Stop our military spending and we can hope for a world of peace"
End The War on Libya! 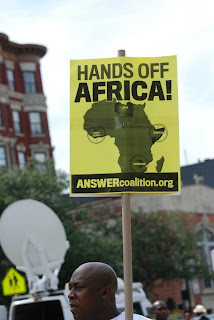 Hands off Africa! Peace Bro. Jesse. 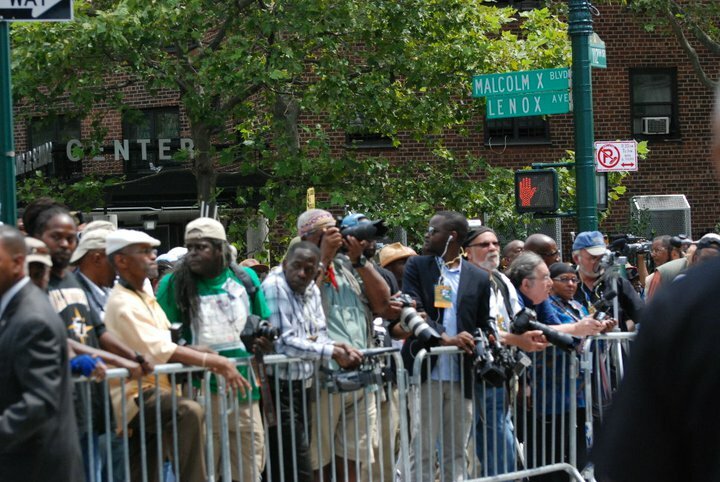 Do you know if there is any footage online of Amiri Baraka's perfromance at the Millions March in Harlem? I wanted to link to it for an article I'm working on. Peace and Ramadam Mubarack. Peace. I wish! I've been searching for it myself!